This super easy Peanut Butter Chocolate Fudge melts in your mouth. It’s creamy, buttery, rich and delicious and made 100% without refined sugar and dairy. I have added just a little sea salt flakes to give the fudge a slight salted caramel flavour. The chocolate peanut butter flavours lingers in your mouth after taking a bite. It feels decadent. Yet you could argue that this melt-in-your-mouth fudge is healthy, even very healthy. Why? This fudge is first of all made with the best organic, natural ingredients: organic sugar free and raw peanut butter, raw cacao powder, pure cacao butter, virgin coconut oil and local honey. All of the ingredients are either raw or minimally processed so they conserve their wide range of beneficial antioxidants. Coconut oil for example contains a unique form of saturated fat, rich in medium-chain triglycerides, which has many health benefits. Unlike many other fats, your body can easily absorb it and turn it into energy. Research also shows that I can help stimulate your body’s healing process and enhance your endurance as an athlete. Peanuts are a bit controversial in the world of health food as they are easily susceptible to mould and become rancid quickly, in which case they can pose a risk to your health. However, fresh raw peanuts are very rich in antioxidants and monounsaturated fats that support heart health. 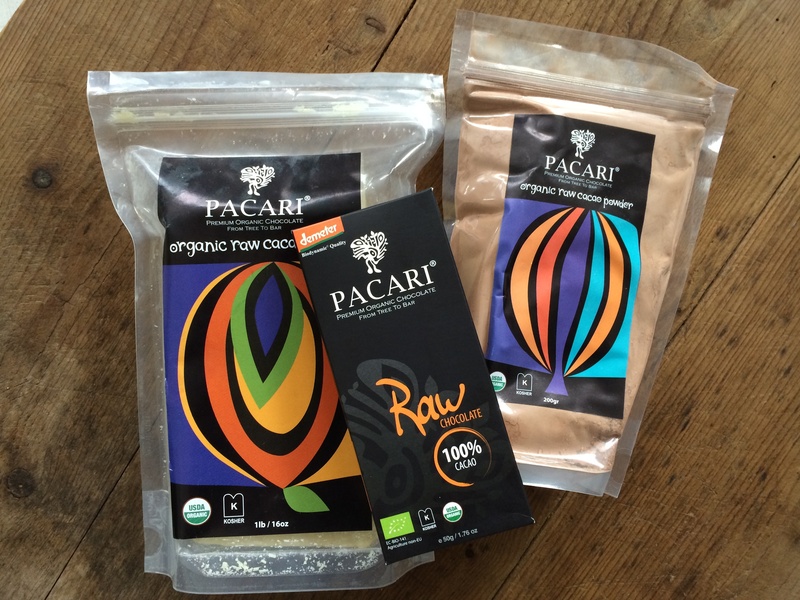 Raw cacao is also very rich in antioxidants and, like peanuts, it contains heart-healthy fats like oleic acid. 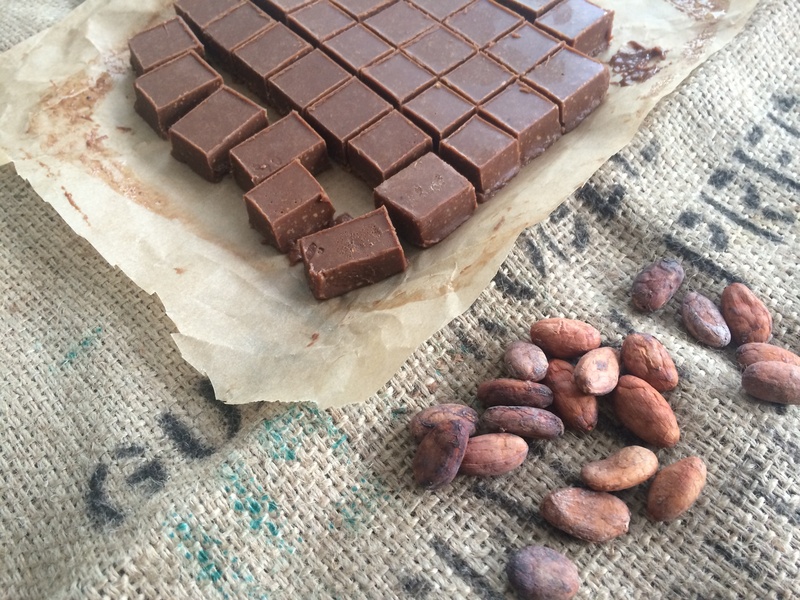 Cacao is also incredibly rich in a wide range of important minerals, including magnesium and iron. And we all know cacao makes us happy, very happy! 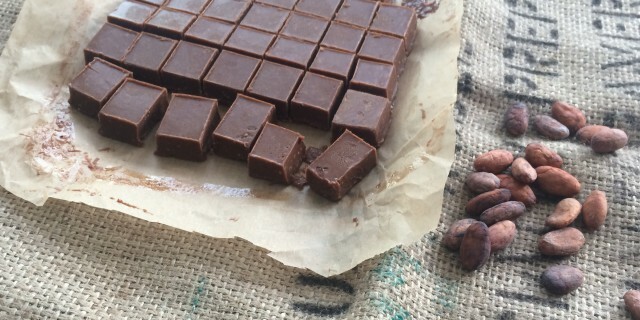 The ‘happy’ chemicals in cacao help lift our mood and can even create a sense of bliss. If you aren’t been convinced yet about the many health benefits of this Peanut Butter Chocolate fudge, just go and make them as they are simply delicious! Who needs convincing anyway? Melt the cocoa butter au bain-marie. When it’s half melted, add the coconut butter. Turn off heat when the butters are melted. Then, add in the raw honey mixing thoroughly. Add the peanut butter, cocoa powder and vanilla. Mix together thoroughly using a whisk. At the very last moment, add the sea salt flakes. Line a square baking tray with baking paper with the paper folded over the sides. Pour the fudge into tray. Allow to cool down in the freezer. When solid, cut up into small cubes. You can serve them right away! Make sure you store your leftover fudge in a air-tight container in either the fridge or freezer. If you store them at room temperature, they will become too soft.